AUBURN, Ala. – University of Arkansas junior Maria Fassi fired an event record 8-under 64 and leads the field after round one action at the Evans-Derby Experience in Auburn, Alabama, on Sunday. Fassi’s 64 helped the third-ranked Razorbacks to a first-round 280 and second place behind No. 31 Florida State who opened with a 10-under 278. Host No. 27 Auburn is tied for third with No. 5 Duke shooting a 3-under 285 at the Auburn University Club followed by No. 9 South Carolina with a 2-under 286 rounding out the top five team scores. Fassi’s stance at the top of the leaderboard is the eighth time this season she has led at the completion of a round. The Hidalgo, Mexico, native has won four of the team’s six events this year. It is her eighth round in the 60’s and is the second time this season she has carded a personal best 64 in a collegiate event. The Razorback All-American’s scorecard was all red with three birdies on the front nine and five birdies on the back side of the course. Fassi reeled off six birdies in a row on holes 8-13 for her 64. 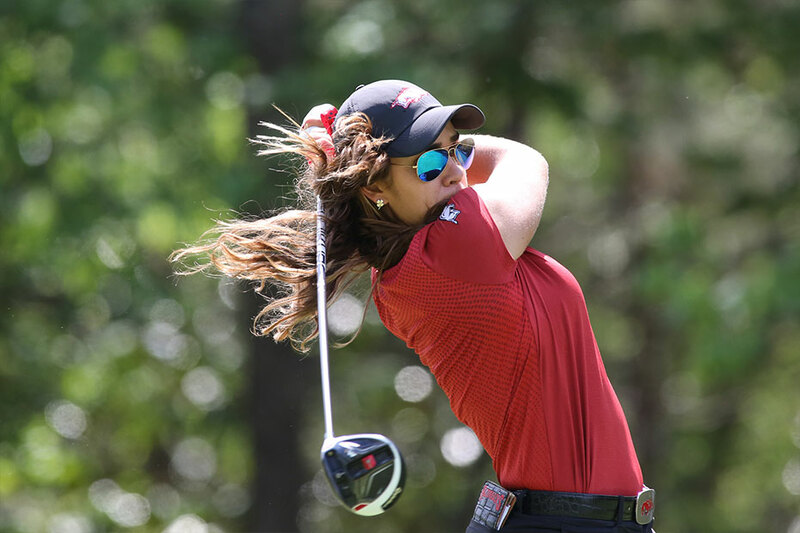 Fassi has a three-shot lead over Ainhoa Olarra of South Carolina and teammate Maria Hoyos of Arkansas. Junior’s Dylan Kim and Kaylee Benton, along with senior Alana Uriell, all counted rounds of even-par 72. The trio is tied for 22nd overall. They posted 11 birdies with Uriell picking up three of her four birdies on the back nine. Junior Cara Gorlei was also solid with a 3-over 75 in the first round. Freshman Hoyos, playing as an individual, is tied for second overall. Hoyos opened with a first-round 67, picking up seven birdies in 18 holes.